Discover stylish modern and contemporary rugs, cushions and wallpaper coverings from British brand Villa Nova. 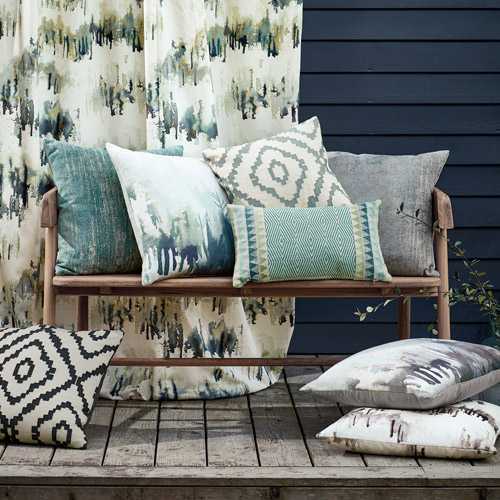 Each collection provides distinctive prints and soft furnishings that will suit any modern interior design spaces. The Norrland Sami Shaker Cushion in Shaker grey and beige by luxury British textiles brand, Vil.. The Hana Nui W547/04 Wallpaper in Oasis by luxury textiles brand, Villa Nova is reminiscen..
British brand Villa Nova has collaborated with world-renowned Flemish brand Louis De Poortere t.. The Hana Makisu W548/04 Wallpaper in Ocean Blue by luxury textiles brand, Villa Nova. Insp.. The Marka Rug - Verdigris is a flat woven stylish rug that is united with an authentic blend of tone.. The Hana Malmo W544/11 Wallpaper in Indigo is one of the many beautiful textural and metallic w.. The Hana Malmo W544/05 Wallpaper in Cement is one of the many beautiful textural and metallic w.. The Huari Kamba Rice Cushion by Villa Nova is a luxurious 60cm by 60cm cushion that i.. The Hana Kicho W549/05 Wallpaper in Indigo Blue is a beautifully unique striped wallpaper desig.. The Hana Nui W547/02 Wallpaper in Porcelain by luxury textiles brand, Villa Nova is remini.. The Huari Kanari Pepper Cushion by Villa Nova is a luxurious rectangular shaped 50cm by&nb.. The Hana Malmo W544/01 Wallpaper in Cinnamon is one of the many beautiful textural and metallic wall.. The Hana Akina W545/02 Wallpaper in the colour 'Indigo' is a beautiful luxury wallpaper that boasts .. The Huari Kamba Pepper Cushion by Villa Nova is a luxurious 60cm by 60cm cushion that..
Villa Nova is a luxurious brand that specialise in stylish soft furnishings that evoke unique a..
Villa Nova is a British luxury textile and soft furnishing brand that specialise in the design and m..
British luxury homeware brand, Villa Nova specialises in the design and manufacture of vivaciously contemporary floor rugs, wallcoverings and cushions that will transform your room into a detailed art-inspired space through eclectic designs and on-trend colours. Whether you are looking to renovate your entire home or commercial space or you are looking for an accent rug or cushion for a finishing touch, the Villa Nova range will suit your personal interior design preference and taste. Explore Villa Nova's luxury floor rug, wallpaper and cushion categories below, or view their entire collection by simply scrolling down. The Villa Nova Rug Collection features a vast array of modern styled rug designs and trusted traditional weaves for durable and timeless pieces that will last both in fashion and durability. The Villa Nova Rug Collection consists of numerous floor rug designs that have derived from a collaboration between Villa Nova themselves and renowned luxury floor rug brand, Louis De Poortere with rugs ranging from flat weaves to hand tufted rugs. The Villa Nova flat weave rugs are ideal if you love a simple yet exceedingly soft surface to place your feet on. Woven with a soft chenille material, the Villa Nova Flat Weave Rugs boasts intricately woven details to create unique textures that will act as the perfect surface for your stone, wood, tile or carpet floors. The Villa Nova flat weave rug designs feature the Sudare Rug - inspired by Japanese artisan latticework, the Freyr Rug - a geometric design that channels retro style and contemporary appealing textures, the Marit Rug - a folk art inspired floor rug pattern that combines traditional intricately woven chenille yarns and modern hand-painted marks for an expressive style, the Tobi Rug - a bold floor rug that boasts contemporary geometric patterns that take influence from traditional folk art, the Akina Rug - the most floral of the Villa Nova rug designs that echoes batik styles and washed out pastel tones for an authentic antique worn appearance and finally, the Marka Rug - a richly textured flat weave floor rug that combines soft chenille tones with eye-catching contemporary metallic highlights for a worn yet attractive distressed aesthetic. As well as flat weave rugs, Villa Nova also designs and manufacture the finest hand-tufted rugs that will add ultimate comfort to your living or commercial space in an animated and eclectic manner. Constructed from a deep, luxurious pile of woollen fibres, the Villa Nova luxury floor rugs are incredibly sumptuous in texture whilst their statement patterns, shapes and colours ensure that they are incredibly modern in design. The Villa Nova hand-tufted rugs include the Haldon Rug - a bold geometric lattice styled design that boasts contrasting viscose and wool yarns, the Hana Rug - a floral floor rug design of a trailing wisteria in multiple vibrant tones for a bold accent that will instantly captivate your guests and finally, the Sami Rug - a striking geometric pattern inspired by folk art. The Villa Nova Cushion Collection boast similar modern designs, prints and patterns in the finest quality material for cushions that will add both comfort and contemporary style to your sofas, chairs or beds. With many of the Villa Nova cushion designs matching the brand's opulent floor rugs, you can create a complete and coherent interior decor scheme that will ooze splendour in any room. Designed in two separate themes; the Norland and the Huari, the Villa Nova cushions are incredibly unique with many of the designs boasting artistic prints in both expressive and abstract styles in a wide spectrum of colour combinations. The Norland Cushions have been inspired by Nordic forest landscapes with the designs ranging from hand-painted patterns to geometric prints that embrace the still spirit, colours and patterns of nature and everyday life. The Huari cushion designs boast a slightly more rustic style achieved through painterly marks and tribal patterns inspired by native central and South American culture, art and ceramics. Colours consist of earthy russet, ochre and charcoal tones that stay true to African tribal everyday life and culture. As well as intricately design floor rugs and cushions, Villa Nova has created a vast range of incredibly impactful wallpapers that vary in texture, colour, print, pattern, style and finish. Explore the six unique luxury wallpaper collections below. One of the more urban-inspired wallpaper collections, the Renzo Wallpapers focus on architectural patterns, geometric lines and urban inspired finishes such as distressed concrete and polished plaster resulting in alluring backdrops that will add statement modern style to your walls whether you are looking to decorate your entire room or a singular feature wall. Other wallpaper collections by Villa Nova consist of a more delicate and feminine style featuring floral patterns, painterly decoration and soft colourful palettes. The dainty Hana Wallpaper Collection boasts beautiful soft tones and Japanese inspired blossoming flower and tree subjects that graciously climb the wall as well as geometric repeat patterns that mirror natural subjects such as water and textures. Mix and match the Villa Nova contemporary wallcoverings, cushions and floor rugs for a truly eyecatching interior decor scheme whether you are looking to decorate your home or commercial space with artictically inspired designs, patterns, colours and textures.